Mels Magical parties | Children's Entertainer in Hertfordshire, Herts, Beds, London. Welcome to Mel’s Magical Parties – Children’s Party Entertainer! Hertfordshire’s Leading Professional Childrens Entertainer. Covering Herts and surrounding areas, Hertfordshire, Beds, Bucks, Cambridge, Essex and London. Let Magic Mel Entertain at your special occasion. Whether you have a Birthday party, Family party, Christmas party, Fete, Wedding or any other event, Mel can keep the children entertained and laughing for the whole party! Mel’s Magical Birthday parties are a blend of comedy and magic She is an Associate Member of The Inner Magic Circle (AIMC) and a Member of Equity. Mel has entertained at many Childrens Parties, from Private birthdays at houses to a tea party at Kensington Palace! Magic Mel offers several programmes From a 1hr Fun Entertaining Magic show, Plate spinning, balloons to a Full 2-hour party including all the games. Appearance of the Mel’s Magic Bunny at the end! Children love those magic spells from marvellous magic Mel.! 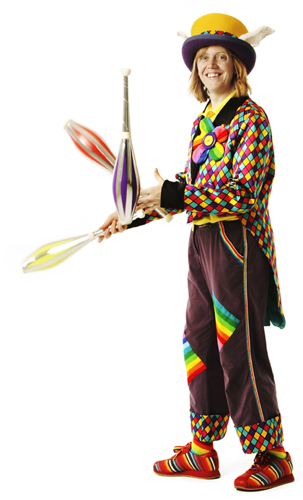 Circus skills have always been a fascination for children and adults, Mel offers an exciting insight into these skills, juggling, riding a unicycle, plate spinning, Stilts, poi, Devil sticks and more. Brownies and Guides badges are also fully covered with a structured programme and ball making. Video by http://www.thequickbrownfox.co.uk/ Crafting High Quality Family videos for everlasting moments. Mel is an expert exponant of the magical art of close up magic with the very difficult mix and mingle her speciality. She amuses and bemuses her audience at Corporate functions and Social gatherings adding a spice to your event. Associate of The inner Magic Circle A.I.M.C, Equity, CRB. Mel’s Magic Children’s Entertainer is based in Hertfordshire. Covers all areas inc. Hertfordshire, Hertford, Herts, Ware, Stevenage, St Albans, Watford, Enfield, Cheshunt, Hoddesdon, Hitchin, Enfield, Harlow, Letchworth, Welwyn, Harpenden, Royston, London, Middx, Beds, Bucks, Windsor, Berks, Luton, Surrey, Cambridge, Oxford, Kent, Essex, Harlow, Chelmsford, Braintree, Bishops stortford many more.